Over the last year, Sugandhi and I have filed a few RTIs to obtain information about projects/proposals that we felt were against the environment and needed more information to understand what was going on. We have been successful in obtaining the information we sought. How we have used this information, we will share in a later post. Initially it was a little difficult finding out what to do. Everything is on the net but we had to search a lot for it. We had to speak to different people to understand the process. I decided to collate all this information into one blog post so that others can benefit from this. Note this information is a collation from different sources and credits have been provided to them at the end of the post. The information is by no means complete but is enough to get one started to file an RTI. So what is RTI Act? It is an Act to provide for setting out the practical regime of right to information for citizens to secure access to information under the control of public authorities, in order to promote transparency and accountability in the working of every public authority, the constitution of a Central Information Commission and State Information Commissions and for matters connected therewith or incidental thereto. Right to Information is a fundamental right under Article 19(1) of the Constitution. Every citizen has a right to know how the Government is functioning. Right to Information empowers every citizen to seek any information from the Government, inspect any Government documents and seek certified photocopies thereof. Some laws on Right to Information also empower citizens to official inspect any Government work or to take sample of material used in any work. 1. Understand the goal you have in mind and then list the information you want to seek. 2. Fill in the application. The RTI form is available on the website of the department concerned. For example: the forest dept website has the RTI form under the RTI section. Sample form can be downloaded from here. 3. Write a covering letter along with the RTI form. Just a good habit and practice. Be polite and courteous. This is after all an official communication. Ensure you ask for Attested copies of the documents you need. 4. Every public authority should have a Public Information officer (PIO) in every Administrative Office. The Karnataka Government has a “Know your PIO” website. You can find the right PIO by clicking the link below. 5. Pay a fee of Rs 10 in the form of Postal Order at your local Post Office and mail it to the Public Information Office (PIO) for that department as Registered Post or Speed Post with Acknowledgement Due. Make sure that acknowledgement due slip is not missed out. This helps you know when the post was received by the department. Some states have different fee for RTI. Please check accordingly. You can also hand deliver it and collect an acknowledgement from the concerned department/office. In case the documents requested is more, the PIO can request for a further fee. We had paid Rs 20 Postal Order in order to reduce the turn around time (if any) for one RTI that was urgent. Additional fee requests and name of Information Commissioner for Karnataka can be found at the link below. At the time of writing this, the Karnataka State Information Commission website which has this information was not working (www.kic.gov.in) so I have provided an alternate one. 6. Wait up to 30-40 days. (Invariably it is more than this). Always give the benefit of doubt to the PIO and wait for extra 10 days to allow for the transit time. Governments work slowly. 7. If you receive the information requested, use it in the appropriate and constructive way. If not, you will either get no response or a refusal letter with the reason specified. If additional fee is requested, then ask for calculation of the fee and pay the amount within 15 days of receiving the request and inform the PIO accordingly. If you are not satisfied with the information received (partial information), have no response or refusal to request, then go in for the first appeal. If you do get a response, ensure you keep every single document with you, including the cover that was sent. On speaking to a lawyer friend, he mentioned, a common reason for RTI to be rejected is when opinion is sought/solicited. Framing the question correctly is very important. Example : “Does the authority have power to pass the order?” might not get you the right information you need, but asking “under when section or rule has the Order been passed?” might get you more details. 1. If no response to your RTI request, write a complaint letter and fill up the first appeal. However, if you have received a response that you think is not correct, then you have 30 days to file an appeal. Sample for can be downloaded from here. 2. Find the right Appellate Authority. If there are multiple AAs and you are not sure which one is correct AA for you, just send it to anyone. He will either deal with your appeal himself or forward it to the right AA under intimation to you. The first appeal could be to the designated senior office in the department. Example : In the case of the Karnataka Forest Department, we were asked to send the First Appeal to the PCCF, we had initially sent it to the First Appellate Officer at MS Building. 3. Send the first appeal via Registered Post or Speed Post with acknowledgment due. Make sure you have a covering letter stating the issue apart from the Form. 4. Send the same via email if you have the Appellate Authority’s email to speed up the process. Do mention that a hard copy has been sent via speed post as well. The information sought be provided immediately free of cost. Compensation be provided for not supplying me information within the prescribed time limit. Disciplinary action be initiated against erring officers for not complying with the law. 6. There is no fee for first appeal though some states explicitly mention it in their website if there is a fee. 8. Some AAs may call you for a hearing, whilst many other do not. If you do not attend the hearing, a decision will be given in your absence on the basis of documents/merit. If you go for a hearing, take all relevant documents (everything) with you. 9. If the information is important but not urgent and you feel that the PIO has no vested interest in the information, be kind to him and allow him more time. 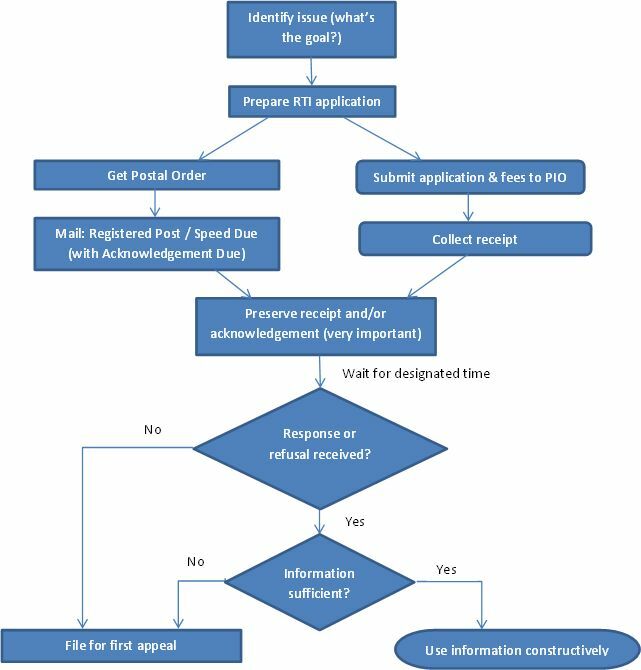 Click here for a workflow for the process for filing the first appeal. 3. Make all PIOs Respondents. You may also like to include AA as a Respondent. 4. If there has been no response from the PIO and the AA, you must also include proof of dispatch/delivery of the application/appeal. Click here for a workflow on how to file a second appeal. I would like to thank the various websites that have put up information on the RTI. They have a lot of detailed information, sample forms, and even help people in need. Many of our friends have also helped us by providing us contacts and information. Hope this information helps you and you get the information you need! Its your right! Note: There is a freewheeling talk by Biswajit Mohanty in Bangalore on August 18, 2013, about RTI for wildlife conservation. Click here for details. Venue: Vittala Eye Hospital, Banashankari III Stage, Hoskerehalli, Bangalore. Time: 6 PM – 8 PM.